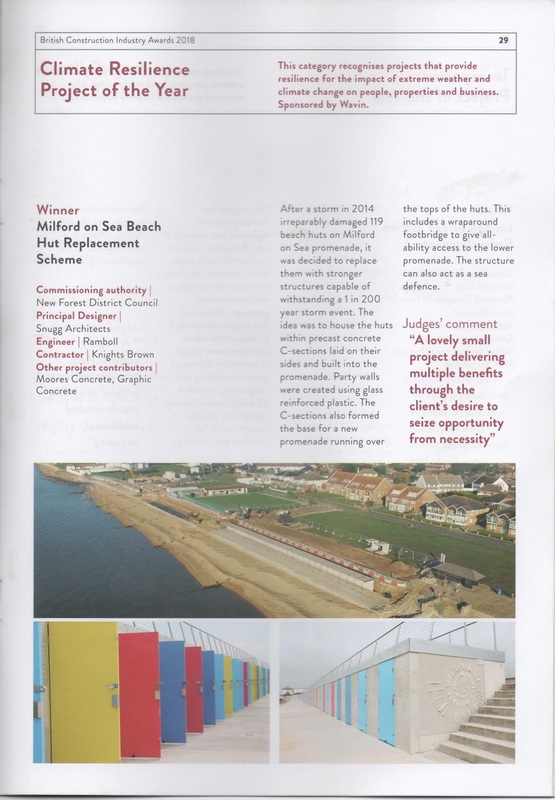 Milford on Sea Beach Huts have won the Climate Resilience Project Award 2018 which is presented by the British Construction Industry Awards. Even with the low quality stainless steel that was reported earlier in the year?....or have I missed something? The problem with the stainless steel wasn't low quality but because the architects insisted on a matt finish instead of a polished one which was what was recommended by the supplier. The matt surface attracts salts in the atmosphere which attach to and discolour the surface of the steel. It isn't rust but just looks like it. However a lot of us are surprised that these huts have won a Climate Resiliance Award when so many of the doors less than 2 years old have already started to fall apart and the colour palette used on them as insisted on by the Council renders the whole project dull and uninspiring.